MainAll NewsUS & CanadaCan Detroit no Longer Govern Itself? Can Detroit no Longer Govern Itself? A poster child for urban decay, Detroit may lose the ability to govern if its city council is replaced by a state-appointed technocrat. Residents of Detroit, a US city which has long been a poster child for urban decay, may lose the ability to govern themselves if their city council is replaced by a state-appointed technocrat. Michigan Governor Rick Snyder is expected to name an emergency manager in the coming days in an effort to stave off the bankruptcy of the Motor City, AFP reported. The move by a white, Republican governor to take control of a predominantly black and Democratic city has drawn intense criticism and charges of racism. "Has Michigan become the new Mississippi of our day?" said Reverend Wendell Anthony, invoking the history of attacks on black voting rights in the South. Detroit needs a partner, not an "overseer," Anthony, head the local chapter of the National Association for the Advancement of Colored People, told a press conference Tuesday. A state takeover would also be fundamentally un-American, said John Philo, director of the Sugar Law Center for Economic and Social Justice, which has challenged the emergency management laws in court. "Democracy does take time, but we do think that in the long run that's the process that can enact lasting change without social and civil unrest and comes to better solutions," Philo told AFP. Emergency managers have the power to eliminate entire departments, change labor contracts, sell city assets and rewrite laws without any public review or input. Currently in control of four smaller Michigan towns and cities and three school districts, their success rate is the subject of much debate. Supporters say they are the only way to tackle Detroit's seemingly intractable problems. "The motto developing here is 'Bring it on'," Sandy Baruah, head of Detroit's regional chamber of commerce, said in a telephone interview. "The speed of change must be much greater than the current political structure will tolerate and an emergency manager will help change that dynamic." The conservative Detroit News said last week that the city has exhausted all other options and must now "face reality." "Detroit is on life support, in political paralysis, and needs outside help. The sooner Snyder can send in an emergency manager to stop the bleeding, the better," the newspaper wrote in an editorial. The more liberal Detroit Free Press agreed, writing that the idea that the city can "cut its way out of this mess" or provide "any reasonable level of service" to residents under the current debt load is "ludicrous." There is no doubt that Detroit is in serious trouble and everyone acknowledges that the problems go back decades. Once the fourth largest city in the United States, Detroit has seen its population shrink by more than half from 1.8 million people in 1950 to 713,000 today. Racial tensions sparked by the civil rights movement -- and the devastating 1967 riots -- exacerbated white and middle-class flight to the suburbs. Businesses followed suit, further shrinking the tax base. With less revenue, the city had to cut back on services, prompting more people to leave. Then the birthplace of the US auto industry saw its main employers go through round after round of mass layoffs as factories were automated or outsourced and Asian competitors siphoned away market share. Abandoned skyscrapers, factories and homes litter the landscape. Crime is rampant. Money has gotten so tight that firefighters started buying their own toilet paper -- until the Free Press wrote a story about it and truckloads of rolls were donated. There have been positive signs in recent years. Artists and young people have been moving into the city to reclaim some of its architectural jewels, and Mayor Dave Bing has been widely praised for cleaning up after a succession of corrupt predecessors. But the city has been borrowing money for too long to pay its bills. It is rapidly running out of cash to operate and is expected to end the fiscal year $100 million in the hole. Long term liabilities -- including the cost of pensions and retirement health benefits -- exceed $14 billion. "The recent actions are not enough to solve both the short-term and long term needs of the city," Snyder said last week after a financial review team submitted its scathing report. 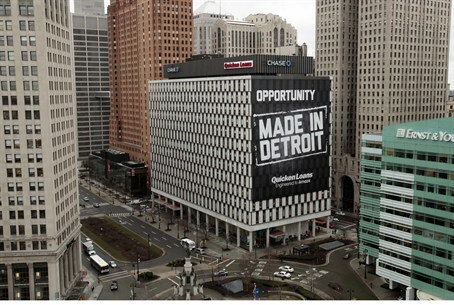 "For all of Michigan to be successful, we need a thriving and successful Detroit."